MATTHEWS, JOHN, politician; b. probably in England; d. 20 Aug. 1832, perhaps in England. John Matthews’s accounts of his youth hint at a genteel background. He claimed attendance at an English college in Paris and attended, some time after 1779, the Royal Military Academy, Woolwich (London). He served in the Royal Artillery for 27 years until his battalion’s reduction in March 1819, when he retired on a pension with the rank of captain. His period of active service was not continuous, though: at some point during the Napoleonic Wars he took up farming “to retrieve the reduced condition of my family,” only to be ruined by the agricultural crisis that followed the peace. He then rejoined his battalion for the sake of pay until its disbandment 18 months later, when he emigrated to Canada. Matthews reached Quebec shortly before the death of the governor-in-chief, the Duke of Richmond [Lennox*], in August 1819. 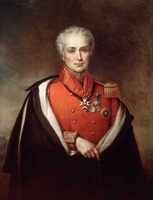 He presented himself to Richmond’s son-in-law Sir Peregrine Maitland*, lieutenant governor of Upper Canada, as an old friend of the duke’s and claimed to have come out upon Richmond’s promise to put him in charge of a planned military colony. 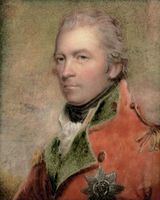 He sought Maitland’s aid in settling in Upper Canada and established himself temporarily near Queenston. Maitland was willing to help, but Matthews proved hard to please and their relationship soon soured. The lieutenant governor successively recommended sites on Lake Simcoe and Rice Lake. Matthews refused these, while asking for an assortment of locations, all of which were either reserved or pre-empted. At last he was summoned before the Executive Council and pressed to accept an 800-acre estate on the Thames River in Lobo Township. Matthews, his family, and servants proceeded to Lobo in October 1820, forming a train of “nearly thirty persons . . . six waggons, one cart, twenty-four horses, a flock of sheep, and some cows.” As soon as he arrived, he let the government know of his disappointment. He had sold his British properties at a loss of 1,000 guineas in order to speed to Richmond’s side, and had been rewarded with stony oak-plains worth a dollar an acre. “This, Sir, certainly was not the sort of service the Duke proposed or intended to render me.” He feared that Maitland’s good intentions were thwarted by influences with which the lieutenant governor could not contend. This was the first murmur of a theme that was to become a staple of Matthews’s political discourse. Matthews now began to covet the estates of a neighbour, the magistrate Daniel Springer, whom he accused of enlarging his holdings by force and fraud. He dropped these charges when told that Springer’s allegedly fraudulent claims had been certified by Thomas Talbot*, the aristocratic patriarch of the London District, but he continued to pursue the magistrate with charges of official and personal misconduct. A series of letters harped on Springer’s indolence, drunkenness, rapacity, and deceit; on his reputed paternity of his associate in villainy, deputy surveyor Roswell Mount; and even, once, on the “unfortunate condition” of his eldest daughter (a misfortune to which Matthews, with daughters of his own, was no doubt especially sensitive). 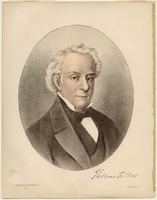 Matthews also began feuding with the commissioners for forfeited estates and their secretary, James Buchanan Macaulay*, over two lots they had sold him. In one case they had given him a title-deed to a different lot from the one he claimed to have purchased; in the other they were simply unable to supply an adequate deed. In the second case Maitland supported Matthews, while chiding him for his insolence towards the commissioners. The lieutenant governor asked the commissioners to refund the purchase price, but to his chagrin they refused when advised by Solicitor General Henry John Boulton* that they had no legal power to do so. Boulton at once was added to Matthews’s list of enemies, as was Attorney General John Beverley Robinson* for failing to take seriously the charges against Springer. “There is a jealous connexion of friendship, of family, and of interest throughout the province,” Matthews told Maitland in 1822, “and under those circumstances every thing I say is misrepresented, and every thing I do is misconceived with a boldness truly astonishing.” His calumniators were encouraged, he wrote, by the knowledge that he was not in Maitland’s favour. The incident for which Matthews is especially remembered happened on the last day of 1825. In the evening he was among a group of assemblymen who attended a theatrical performance by an American company. While the actors got ready, the musicians played popular airs, starting with “God Save the King!” and “Rule, Britannia!” Various members of the assembly competed in calling for a Jacobite song, “Hail, Columbia!” and “Yankee Doodle.” That day the assembly, agitated by Robinson’s Naturalization Bill, had passed resolutions which humiliated the provincial government by rejecting the official view that post-loyalist American immigrants were aliens. One or two pro-government members took it in bad part when there was a call for “Yankee Doodle.” A reformer’s attempt to remove a tory’s cap sparked a momentary scuffle, but the play then proceeded without further fuss. Matthews protested that he had evidently been condemned unheard. There had been nothing “riotous or outrageous” about the incident; “it was all fun and frolic.” The construction his traducers put upon it “must have originated in paltry political vexations, and in great baseness and malignity of Heart.” He did acknowledge, though, that the political events of the day had coloured those of the evening. In forwarding Matthews’s reply, Maitland seized on this admission to present Matthews’s conduct in the worst light. In September 1826 the Board of Ordnance ordered that Matthews should return to England by the first ship of the next season, and in the mean time go at once to Quebec. This order was transmitted to him from Quebec on 8 Dec. 1826, three days after the start of the new legislative session. The House of Assembly referred the affair to a select committee, which took evidence from almost every member of the theatre audience. Its report stressed the triviality of the incident, the impossibility that Dalhousie could have obtained “full corroboration” of misconduct that had not occurred, and the iniquity of condemning Matthews on the evidence of secret informers. It noted the impropriety of trying to place Matthews under arrest at Quebec during the parliamentary session. Matthews’s pension had been suspended, and it is commonly stated that he went to England in order to recover it and died there. In fact, it was restored without his going to England. Re-elected with Rolph in 1828 (after first declining to stand, because of ill health), he played his usual prominent role in the session of 1829 but seems to have missed that of 1830. When his wife died, in April 1830, he was reported to be in England, and he may have stayed there until his death. Matthews was one of those post-war British immigrants to Upper Canada whose hostility to the provincial government was partly rooted in disappointment of their material expectations and a jealous contempt for the local élite. In the case of Matthews, a Unitarian, as in that of the Quaker Charles Fothergill*, religious heterodoxy played a part by fostering an aversion towards the narrow Anglican orthodoxy of the provincial establishment. Matthews has been dismissed as a self-deceiving egoist, often carried away by his own inflated rhetoric, a dissipated malingerer, an advocate of paternalistic social ideals which were old-fashioned, self-contradictory, and hopelessly utopian. There are grounds for believing that these judgements underestimate him. There is no evidence that he was more dissipated than others of his time and class. His ill health, which he traced in part to a fall from his waggon in 1820, was real enough to alarm his friends. Above all, he shows signs of too much intelligence to be written off as a political nitwit. Matthews’s was in fact a more complex personality than at first appears, and his paternalist rhetoric may at once represent a sincere commitment to the ideal and a satiric comment on society’s failure to achieve it. One clue to his complexity is his outspoken Unitarianism – so inconsistent with his character as a simple old soldier – which inspired a fellow assemblyman to call him “the Reverend John Matthews.” Another is his taste for subversive irony. When Maitland spurned his first charges against Springer, Matthews solemnly announced his conclusion that in future he should keep silent about abuses that were reported to him, “no matter how imperiously I should feel it my duty to expose them to His Excellency.” When as an assemblyman he was invited by Maitland to dinner, he declined with the dry remark that his attendance could give pleasure to no one, but he punctiliously sent Lady Sarah Maitland (his old patron’s daughter) a note regretting the circumstances that kept him from “once more paying my humble and most dutiful respects to your Ladyship.” Even in the letter that was supposed to exonerate him from the charge of disgraceful conduct at the theatre, he characterized that day’s resolutions on the alien question as a decision “that the King had thousands more of good and excellent subjects than many of his friends were willing to allow him.” It was Matthews who presented Timothy Street’s satirical petition against the Marmora Iron Works to the assembly in 1828, and he may well have had a hand in its composition. Matthews’s occasional invasions of the local Court of Requests in order to denounce the presiding magistrates suggest that his subversive instincts were allied with a politically effective sense of theatre. It is likely that this theatricality (somewhat compulsive perhaps, yet not entirely uncontrolled) pervaded his personality, and that his Falstaffian bombast and Shandean emotionalism were at least in part an affectation based on available cultural models. Matthews, in short, who owned a notable library, was more intelligent than he pretended, and his buffoonery was most likely the expression of an authentic English eccentricity rooted in social alienation. Beneath the grease-paint, a courageous determination is evident in the relentlessness with which, in letter after letter to Maitland, he vilified enemies who enjoyed the lieutenant governor’s confidence. “Captain Matthews is violent,” observed William Lyon Mackenzie* in 1828, “but he is a tower of strength to the people in the Assembly.” “Matthews political character is of the manly cast,” commented a neutral observer, “for he has always acted as he said he would.” Certainly Maitland and Talbot were not inclined to dismiss him as a clown. By subverting the established order in Middlesex he had proved himself one of the most dangerous men in the colony. Here is the essential context for evaluating his treatment in 1826. It is inconceivable that the incident at the theatre came to Dalhousie’s attention without the connivance of men close to Maitland. 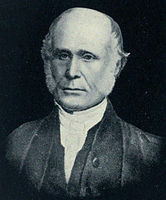 The two known informers against Matthews were John Beikie, clerk of the Executive Council, and Charles Richardson, a law student of Robinson’s who was shortly to take part in the wrecking of Mackenzie’s printing-shop. Beikie by his own admission had entered the theatre midway through the incident, and his account was completely superficial and disconnected. Richardson’s was prejudiced against Matthews but could not disguise the trifling nature of the incident. Both men’s extant reports were written by request. Although it is impossible to say whence the initiative came, Maitland made the most of the opportunity by his own disingenuous commentary on Matthews’s letter of justification and by enclosing Beikie’s and Richardson’s tendentious remarks on it. Like the other vindictive blows struck at this time by the government and its supporters against leading critics, this one rebounded on its perpetrators by its effect on public opinion. Its petty vengefulness was typical of Maitland and his advisers, but it also hints at the danger they perceived in Matthews. [The main manuscript source for Matthews’s career is PAC, RG 5, A1, 45–87 (volume 81 is devoted wholly to him); also relevant are RG 1, E3, 48a: 24–54, and RG 7, G16C. The chief printed primary source on the “affair” is U.C., House of Assembly, Journal, 1826–27, app.P. His political career can be traced in the Journal, 1825–29, the Colonial Advocate, 1824–29, the Weekly Register (York [Toronto]), 1823–24, and the Gore Gazette, and Ancaster, Hamilton, Dundas and Flamborough Advertiser (Ancaster, [Ont. ]), April–June 1828. Paul Romney, “MATTHEWS, JOHN,” in Dictionary of Canadian Biography, vol. 6, University of Toronto/Université Laval, 2003–, accessed April 25, 2019, http://www.biographi.ca/en/bio/matthews_john_6E.html.